On 17th September we were honoured to welcome Amuda to The Centre to update us on the work of IPASC and the progress of his PhD. 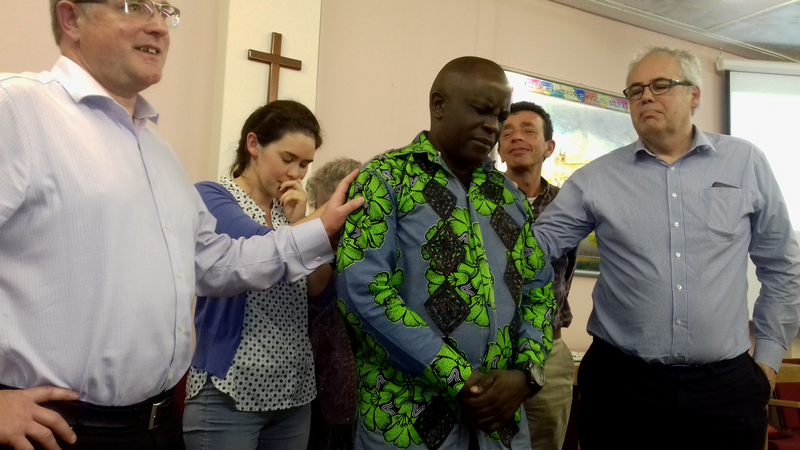 Amuda is the Director of IPASC; a charity founded by Pat Nickson (a dear friend and past vicar of St Mary’s) in the Democratic Republic of Congo. We, as a Church family, are privileged to continue to support the amazing work of IPASC. The support in the UK is coordinated by the Friends of IPASC Trust. Mama Gill (Brown) welcomed us and introduced IPASC, its programmes and vision, and Amuda gave a brilliant presentation and answered our questions. Recently IPASC went through a rather large structural change. In Bunia, The Anglican University of D.R. Congo has integrated the IPASC site as its Faculty of Community Health and Development, this is where the IPASC degree and masters programmes are run. The IPASC Aru site has merged with the Diocese of Aru, where the diploma courses and operational programmes are run. So far the association has gone well on both sites. The Safe Motherhood programme recently received new equipment. There are many things which need to be taken into consideration when trying to improve and develop facilities in DRC. This was exemplified when there were problems when trying to source new delivery beds for the delivery room. Women were giving birth on large wooden tables which were not comfortable, practical or hygienic. The first new tables sourced were cross-shaped and there were negative connotations were associated with this; women had fears that going to deliver their babies would result in their deaths. The tables have been changed again and are now much more suitable and women are much happier. Amuda was pleased to share that maternal health indicators have improved as a result which is really positive. Although there are new delivery beds, delivery kits and basic equipment are still needed to accompany them. The Primary Healthcare programme has been focussed on building safe and hygienic toilet blocks in the local area as facilities in local schools were so appalling that children were going to school and becoming unwell. The Primary Healthcare programme has built toilet blocks in local primary schools, markets and other public places where conditions are not hygienic. There was also great news with respect to the HIV/Aids programme which is going brilliantly at the Aru testing centre. The stigma, which is still big and dangerous in most areas in DRC has been reduced hugely in Aru. In Bunia (IPASC’s other site) and Kinshasa (the capital) the stigma is still bad and there has been very little progress, so visitors are being sent from these areas to the Aru site to learn more about the way IPASC is working which is hugely encouraging. Democratic Republic of Congo is classified as a country with HIGH FRAGILITY. There has been unrest and clashes between ethnic groups which also seems to be heavily political as elections are delayed; a general election was supposed to be held in November 2016 and the government has made various promises as to when it would be rescheduled. According to the constitution, the second and final term of the incumbent president expired in December 2016. During the unrest 100,000 people have been killed and a further 100,000 displaced, many have moved into the region in and around Bunia. Houses were burnt down, so many women and children have been living in very poor temporary conditions for months as men stay behind in their villages. A number of heavily armed Ugandan rebels are active in the Ituri Province and around 2,000 deaths have been attributed to their actions. In the midst of the displacement and disorder a number of Ebola cases have also been reported in DRC. IPASC is working hard to minimise the spread and prevent further cases by informing populations of the dangers and risks of Ebola. They are producing posters and simple documents, radio broadcasts and going into schools to talk about how to prevent infection. 80% of people which are infected die as a result, so IPASC are working desperately hard to prevent infection. We thank God for Amuda; for his great ability, his great determination and his great faith in our great God. Amuda heads back to DRC in the middle of November after completing the work of his PhD. 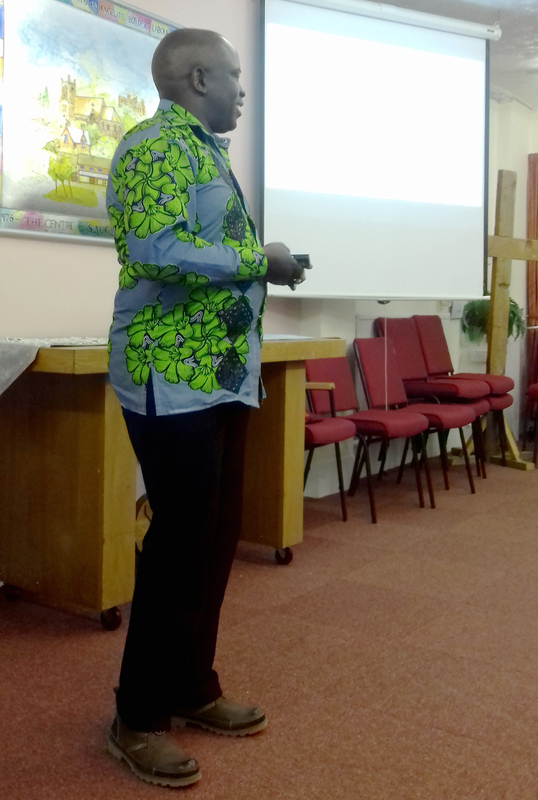 We thank him for his generosity in sharing his news and presenting as he did and we pray for him as he finishes his PhD in Liverpool, travels back to DRC and continues the incredible work of IPASC. We are a family church with activities for all ages and interests, for young adults, families or more elderly members. We also offer support to people at different stages in life. Whether a time of celebration or a time of crisis, we are here to help. Above all, we are a church that believes Jesus makes sense of the world we see around us, bringing meaning and certainty. Need more information? Get in touch.